Instagram has been a phenomenal success story gaining a user base of 2 million people in just four months that are now uploading 300,000 photos a day and now the developers are inviting developers to sign up for access to an Instagram API. 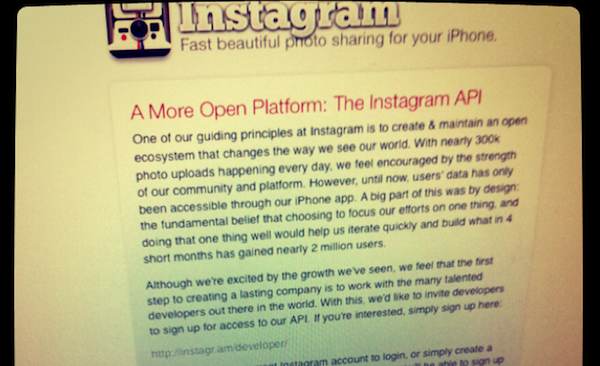 In a blog post, Instagram CEO Kevin Systrom said that the guiding principle for Instagram was to “create and maintain an open ecosystem that changes the way we see our world,” opening up Instagram to other developers is their next step to fulfilling that principle. The opening up of a developers API seems to indicate a shift by Instagram from one of giving users an app to edit photos and share, to one dominated by creating a social image sharing service. This could allow other apps such as Hipstamatic to hook into Instagram and let users share their Hipstamatic photo’s on through Instagram. The blog post doesn’t quite make it clear if this is their intention but it most definitely seems like the logical iteration. At this stage developers can sign up at the developer page using their Instagram login and request access to the private beta. Systrom also takes time to assure users of Instagram that his team has not rushed this process and they have taken time to ensure users data and images are not compromised. Users will also always maintiain ownership and privacy controls of all images.